At stake in the church’s first general council was the simplest, yet most profound, question: Who is Jesus Christ? A brilliant, profligate professor of rhetoric became the church’s leading theologian for centuries to come. The pagan prince of Kievan Rus’ embraced a new faith, leading to the Christianization of the Ukrainian, Russian, and Byelorussian peoples. Dr. Francis Oakley is president of Williams College in Williamstown, Massachusetts. Some useful and accessible reading. A timeline of important events in (mostly western) church history. 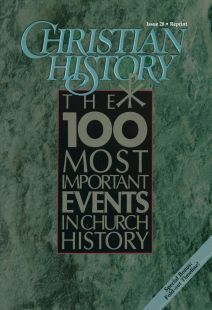 A selective chronology of church history and world events, mostly from a western point of view. They were ordained ministers and missionaries. Then their hearts were “strangely warmed,” and their changed lives gave rise to a worldwide movement.